ORDERS SHOULD BE EMAILED OR FAXED TO TJ PROMOTIONS. PHONE ORDERS WILL NOT BE ACCEPTED. WE WILL ACKNOWLEDGE ALL ORDERS BY EMAIL. IF YOU HAVE NOT RECEIVED AN ORDER ACKNOWLEDGMENT WITHIN 24 HOURS PLEASE CONTACT US. DIGITAL PROOF WILL BE SENT IN (PDF) FORMAT AT FREE OF CHARGE. TWO COMPLIMENTARY CHANGES TO THE ART WILL BE HONORED AT NO CHARGE. SUBSEQUENT CHANGES WILL INCUR AN ADDITIONAL CHARGE AT $15 (G) PER PROOF. VIRTUAL PROOF CAN BE REQUESTED AND SENT IN (JPEG) FORMAT AT A MEDIUM RESOLUTION, WHICH IS SUITABLE FOR ON‐SCREEN REVIEWING, NOT FOR PRODUCTION. THE DIGITAL PROOF APPROVAL AND SALES ORDER MUST BE SIGNED AND RETURNED BEFORE PRODUCTION BEGINS AND THAT CONSTITUTES APPROVAL TO PROCEED WITH PRODUCTION. DELAYS TO PROOF APPROVAL MAY RESULT IN CHANGE ON SHIP DATE. A PRE-PRODUCTION SAMPLE IS TREATED AS A SPECULATIVE SAMPLE AND IS AVAILABLE AT $15 (G) PER COLOR IN ADDITION TO ITEM UNIT COST, PLUS SCREEN CHARGES. RANDOM SAMPLES ARE AVAILABLE FOR YOUR INSPECTION AT FREE OF CHARGE UP TO 2 ITEMS. MORE THAN 2 ITEMS WILL BE CHARGED AT ITEM PRICE PLUS $5 (G) PER BOX FOR SPECIAL PACKAGING. *THE SHIPPING CHARGES WILL BE APPLIED TO ALL THE SAMPLE REQUESTS. NEW ORDER SCREEN SET-UP CHARGE IS $50 (G) PER COLOR. EXACT REORDER SET-UP CHARGE IS $25 (G) PER COLOR. ANY CHANGES MADE ON THE EXISTING SCREEN WILL BE CHARGED AS A NEW SCREEN. NEW ART IS REQUIRED WITH A NEW SCREEN CHARGE, IF REPEATING AN ORDER THAT IS MORE THAN TWO YEARS OLD. REORDERS SHOULD BE SUBMITTED ON A NEW PURCHASE ORDER AND REFERENCE THE PREVIOUS ORDER NUMBER AND DATE. CHANGING ONE IMPRINT COLOR TO ANOTHER WITH SAME ARTWORK WILL BE CHARGED AT $15 (G) PER CHANGE. DUE TO THE NATURE OF THE PRODUCTION PROCESS, A VARIANCE OF 1/16” MAY HAPPEN BETWEEN IMPRINT COLORS. THIS VARIANCE IS CONSIDERED ACCEPTABLE IN THE INDUSTRY. DECAL IMPRINT PROCESS IS AVAILABLE FOR TIGHT REGISTRATION, MULTICOLOR OR PHOTO LIKE ART, AND IS GUARANTEED FOR NO FADING OR PEELING, STAYS ON PERMANENTLY. DECAL PRODUCTION IS 15-20 WORKING DAYS AFTER ART APPROVAL. PLEASE CALL FACTORY FOR DETAIL AND PRICING. SET UP AND SAMPLING CHARGE IS NON-REFUNDABLE. EXTRA CHARGE FOR 22K GOLD OR PLATINUM IMPRINT, ADD $0.65 (G) PER LOCATIONS, WRAP AROUND IMPRINT WILL BE CHARGE AS THREE LOCATIONS. FOR HALO, ADD $0.65 (G) PER PIECE. SPECIFY STANDARD OR MICRO‐SAFE METALLIC GOLD OR PLATINUM. NOTE: MICRO‐SAFE VARIES IN APPEARANCE AND SHINE FROM STANDARD METALLIC. IT IS IMPORTANT TO REMEMBER THAT 22K GOLD OR PLATINUM IS DIFFERENT FROM OUR CERAMIC INKS. IN SOME INSTANCES 22K GOLD OR PLATINUM WILL “BLEED” MORE THAN CERAMIC INKS, SOME ART MAY NOT BE SUITABLE FOR SUCH IMPRINT. PURPLE AND PINK IMPRINT WILL INCUR ADDITIONAL COST OF $0.69 (C) PER PIECE. TJ PROMOTIONS ART DEPT. RESERVES THE RIGHT TO REJECT ANY ART THAT IS NOT CONSIDERED PRODUCTION-READY. ART SIZE AND COLOR ADJUSTMENTS ARE COMPLIMENTARY FOR DIGITAL PROOF WITH NO CHARGE. ART ALTERATION AND DIGITAL CLEAN UP WILL BE CHARGED AT AN HOURLY RATE OF $45(G) QUOTED BEFORE PRODUCTION. TYPESETTING IS CHARGED AT A RATE OF $15 (G) PER LAYOUT. FACTORY RESERVES THE RIGHT TO SELECT AN AVAILABLE TYPE FONT STYLE THAT CLOSELY MATCHES THE DESIRED STYLE. UNLESS SPECIFIED, THE FACTORY WILL SIZE ART TO FIT MAXIMUM IMPRINT AREA ON EACH ITEM. ALL ARTWORK FILES MUST BE PC COMPATIBLE AS VECTOR FORMAT WITH ALL FONTS CONVERTED TO OUTLINES, CURVES OR PATHS. FOUR-COLOR-PROCESS IMAGES MUST BE HIGH-RESOLUTION PIXILATED IMAGES WITH AT LEAST 300 DPI AT 100% ART SIZE. 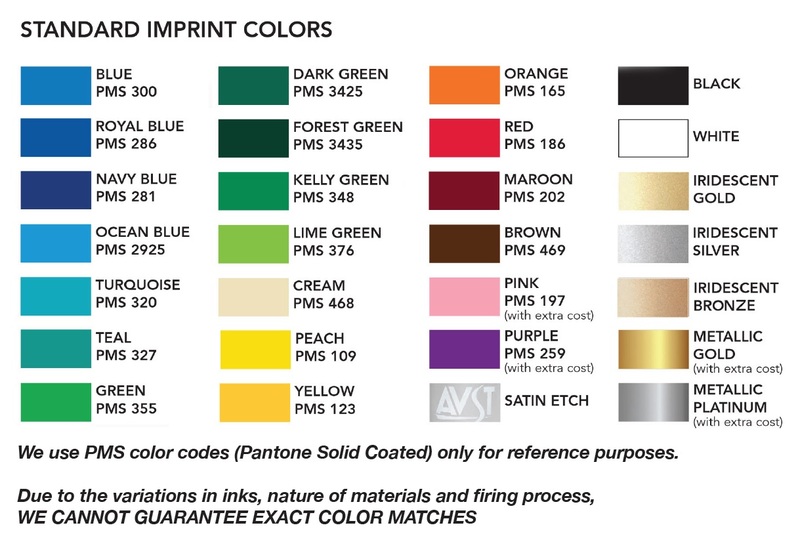 PLEASE SUBMIT DIGITAL GRAPHIC AND PMS COLOR CODES THROUGH EMAIL. HALFTONES FOR DIRECT SCREEN-PRINTING ARE PRINTED AT 50 LPI. GRADIENTS FOR DECAL ARE UP TO 300 DPI. FOR FREIGHT CLAIMS, RECEIVER MUST INSPECT ALL PACKAGES UPON RECEIPT, STATE SHORTAGES OR ANY OTHER FREIGHT ISSUE ON THE BILL OF LADING BEFORE SIGNING. ALL SHIPMENTS THAT ARE SIGNED RELEASES FARGO LINE FROM ALL RESPONSIBILITY. BUYER SHOULD FILE ALL OTHER CLAIMS NOT INVOLVING FREIGHT CARRIER WITHIN 14 DAYS OF RECEIPT OF MERCHANDISE. FOR BREAKAGE CLAIMS, KEEP THE ORIGINAL PACKAGING AND BROKEN MERCHANDISE UNTIL CLAIM IS ACCEPTED BY FARGO LINE. WE ARE NOT RESPONSIBLE FOR SHIPPING DELAYS. PRODUCT SIZE AND COLOR IN THIS CATALOG MAY VARY SLIGHTLY FROM ACTUAL ITEM DUE TO COLOR ADJUSTMENT. SAMPLES ARE AVAILABLE FOR VERIFICATION. DUE TO THE NATURE OF CERAMIC AND GLASS, COLOR, SIZE AND MEASUREMENTS MAY VARY FROM BATCH TO BATCH. SLIGHT IMPERFECTIONS AND IRREGULARITIES ARE WITHIN ACCEPTABLE INDUSTRY STANDARDS, AND ARE NOT CONSIDERED FLAWS. DEFECTIVE GOODS AND/OR BROKEN GOODS WILL BE DEDUCTED FROM INVOICE, OR CAN BE REPLACED AND SHIP BY GROUND SERVICE ONLY—NO EXCEPTION. OUR LIABILITY IS LIMITED TO THE INVOICED COST OF THE ITEM. NEW CUSTOMERS MUST PREPAY ORDERS UNTIL CREDIT TERMS CAN BE ESTABLISHED AFTER THREE ORDERS AND CREDIT APPROVAL. CREDIT CARD PAYMENT OF UP TO $2,000 IS ACCEPTABLE FOR PREPAYMENT ACCOUNTS. A 3% PROCESSING FEE WILL APPLY TO CREDIT CARD PAYMENTS OF ANY AMOUNT FROM ACCOUNTS ON CREDIT TERMS. STANDARD PRODUCTION TIME IS 7 WORKING DAYS AFTER APPROVAL. ANY CHANGES TO AN ORDER IN PROGRESS WILL DELAY PRODUCTION AND SHIP DATES. ALLOW EXTRA SHIPPING TIME DURING THE PRE‐HOLIDAY SEASON. FOR ANY ORDER LESS THAN REQUIRED MINIMUM QUANTITY, ADD $30.00 (G). FOR A QUOTE ON QUANTITIES OF MORE THAN TWICE THE END COLUMN QUANTITY, PLEASE CALL OR EMAIL TO TJ PROMOTIONS. MERCHANDISE CANNOT BE RETURNED WITHOUT AUTHORIZATION FROM FARGO LINE, OTHERWISE, THEY WILL BE REFUSED. FARGO LINE MUST BE CONTACTED WITHIN 15 DAYS OF RECEIPT TO REQUEST FOR AUTHORIZATION. UNLESS OTHERWISE SPECIFIED, ORDERS ARE SHIPPED IN MASTER CARTONS AS STANDARD AND FACTORY RESERVES THE RIGHT TO SELECT THE CARRIER. UPS, FEDEX, AND AIRBORNE SHIPMENTS REQUIRE SPECIAL PACKAGING AT $5 (G) PER CARTON. CHARGE FOR PALLET IS $12.50 (G) FOR EACH. FREIGHT ESTIMATES PROVIDED BY THE FACTORY CANNOT BE GUARANTEED FOR ACCURACY AS RATES FLUCTUATE. IF YOU REQUIRE AN INSIDE DELIVERY, YOU MUST SPECIFY IT IN THE PURCHASE ORDER WITH FULL ADDRESS AND SUITE/ROOM NUMBER. ANY DELIVERY BEYOND A LOADING DOCK MAY BE CONSIDERED AN INSIDE DELIVERY, AND WILL INCUR ADDITIONAL CHARGES. IF AN INSIDE DELIVERY IS REQUESTED UPON CARRIER’S ARRIVAL, IT WILL BE DONE AT CUSTOMER’S OWN RISK AND THE CHARGES INCURRED WILL BE ADDED TO THE ORIGINAL INVOICE. RESIDENTIAL ADDRESS WILL INCUR HIGHER SHIPPING COST AND WILL BE ADDED TO ORIGINAL INVOICE IF IT IS NOT SPECIFIED IN THE PURCHASE ORDER. TITLE TO THE GOODS PASSES TO THE BUYER UPON RELEASE TO THE CARRIER. A $5 (G) BREAK-BOX CHARGE WILL INCUR FOR EACH LESS THAN FULL CASE QUANTITY ORDER/SHIPMENT. SPLIT SHIPMENT HANDLING IS $6.25 (G) FOR EACH DESTINATION. WE SPECIALIZE IN QUICK TURN-AROUND. IF YOU HAVE A RUSH ORDER TO PROCESS, PLEASE CALL US FOR A RUSH SERVICE QUOTE. F.O.B WE SHIP FROM OUR WAREHOUSE IN SOUTHERN CALIFORNIA, ABOUT 10 MILES FROM LOS ANGELES.